Experienced, Local, Successful. Contact Us today! Have you been in a collision. Do you need answers to your questions? What is supposed to happen next? What are your legal rights? Call Us. We specialize in handling auto collision cases and can explain the process over the phone for free. We offer decades of experience with immediate, personal contact. We can explain the process and help you decided what to do next. You need an attorney’s help. Would you try to fix your own car without the proper tools and knowledge? Having an experienced attorney on your side makes a difference. Auto collisions cause serious injuries. Even seemingly ‘minor impact’ collisions can cause life changing injuries. Don’t think that because the facts of the accident are clear that you will be treated fairly by insurance companies. Insurance companies are in the business of making money, not helping you or paying for your injuries and losses. Don’t try and go it alone! 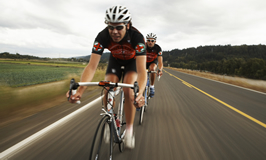 What are your legal rights as an injured bicyclist? As a pedestrian hit by a car? What coverages are available to pay medical bills? What about your property damage? Who pays for your injuries? Call us for help. We offer decades of experience and immediate, free personal contact over the phone for injured pedestrians and victims of bicycle crashes. 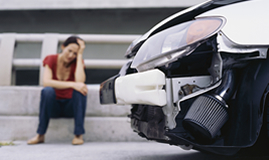 What you do in the immediate aftermath of an accident is critical. Establishing the facts of the event is crucial. Witness statements and photos are extremely value. Early decisions will have a huge impact on your recovery later. Our law office can help. Having an experienced attorney on your side is important. Without an attorney’s help you are likely to receive much less compensation than you deserve. Our office knows the process and will maximize your recovery. Call us! Every fall is different however every fall case requires evidence that the fall was due someone’s negligence. Falling in a store or on someone’s property is not enough for a case. Medical bills will not be paid unless negligence can be established. We are experts in handling trip and fall cases. We offer free, over the phone, evaluation of your slip & fall incident. If you’ve tripped or slipped and fallen it is crucial that evidence be gathered. Photos of the scene and witness statements need to be taken preserved. Often people leave the scene of the fall immediately after the fall. They are embarrassed and in pain. Only later do they realize how serious their injuries are. What do you do now? Before you do anything else call The Law Offices of H.K. Graham! Your case may depend on it! We understand your situation and can help. Having an experienced attorney on your side makes a huge difference. 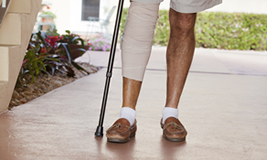 Slip & fall cases are particularly difficult. Consulting with our office as soon as possible after a fall can make the difference between a successful outcome or not. We can help!